We perceive that a great breach has been made in the moral and physical systems by the introduction of moral and physical evil; how or why, we know not; so, however, it is, and it certainly seems proper that this breach should be closed and order restored. That men should pray and fight for their own freedom, and yet keep others in slavery, is certainly acting a very inconsistent, as well as unjust and, perhaps, impious part. Among the strange things of this world, nothing seems more strange than that men pursuing happiness should knowingly quit the right and take a wrong road, and frequently do what their judgments neither approve nor prefer. To all general purposes we have uniformly been one people; each individual citizen everywhere enjoying the same national rights, privileges, and protection. As a nation we have made peace and war: as a nation we have vanquished our common enemies: as a nation we have formed alliances, and made treaties, and entered into various compacts and conventions with foreign States. This country and this people seem to have been made for each other, and it appears as if it was the design of Providence, that an inheritance so proper and convenient for a band of brethren, united to each other by the strongest ties, should never be split into a number. 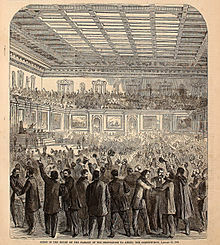 Americans are the first people whom heaven has favored with an opportunity of deliberating upon and choosing forms of government under which they should live. As a nation we have made peace and war: as a nation we have vanquished our common enemies: as a nation we have formed alliances, and made treaties, and entered into various compacts and conventions with foreign States. 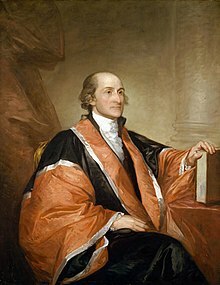 John Jay (12 December 1745 – 17 May 1829) was an American politician, statesman, revolutionary, diplomat, and jurist, who was one of the Founding Fathers of the United States of America. As quoted in "The Present Aspect of the Slavery Question" (18 October 1859), by George William Curtis, Orations and Addresses of George William Curtis. Charge to the Grand Jury of Ulster County (1777). Among the strange things of this world, nothing seems more strange than that men pursuing happiness should knowingly quit the right and take a wrong road, and frequently do what their judgments neither approve nor prefer. Yet so is the fact; and this fact points strongly to the necessity of our being healed, or restored, or regenerated by a power more energetic than any of those which properly belong to the human mind. We perceive that a great breach has been made in the moral and physical systems by the introduction of moral and physical evil; how or why, we know not; so, however, it is, and it certainly seems proper that this breach should be closed and order restored. For this purpose only one adequate plan has ever appeared in the world, and that is the Christian dispensation. In this plan I have full faith. Man, in his present state, appears to be a degraded creature; his best gold is mixed with dross, and his best motives are very far from being pure and free from earth and impurity. Letter to Lindley Murray (22 August 1774), as published in The Life of John Jay (1833) by William Jay, Vol. 2, p. 345. Letter to the President of the English Society for Promoting the Manumission of Slaves (June 1788). "Federalist No. 2" (31 October 1787), The Federalist Papers. Federalist No. 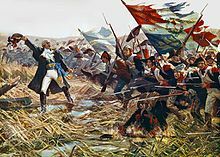 4 (7 November 1787) Full text from Wikisource. It is presumed, that juries are the best judges of facts; it is, on the other hand, presumed that courts are the best judges of law. But still both objects are within your power of decision ... You have a right to take it upon yourselves to judge of both, and to determine the law as well as the fact in controversy. It certainly is very desirable that a pacific disposition should prevail among all nations. The most effectual way of producing it, is by extending the prevalence and influence of the gospel. Real Christians will abstain from violating the rights of others, and therefore will not provoke war. Almost all nations have peace or war at the will and pleasure of rulers whom they do not elect, and who are not always wise or virtuous. Providence has given to our people the choice of their rulers, and it is the duty, as well as the privilege and interest, of our Christian nation to select and prefer Christians for their rulers. George William Curtis, as quoted in Manual Of Patriotism: For Use in the Public Schools of the State of New York (1900) By Charles Rufus SkinnerTake, p. 261. By this constitution [NY State 1777] the right of suffrage was, in several instances, restricted to freeholders; it being a favourite maxim with Mr. Jay, that those who own the country ought to govern it. Son William Jay in The Life of John Jay (1833), volume I, chapter III. U.S. Supreme Court media on John Jay. John Jay bust, by John Frazee (1790-1852), Marble, circa 1831, Size: 24" h., Catalog No. 21.00010, S-141, Old Supreme Court Chamber, U.S. Senate Collection, Office of Senate Curator.